Read more about Jessica and Matthew's laid-back forest wedding on Offbeat Bride, and see more photos here. 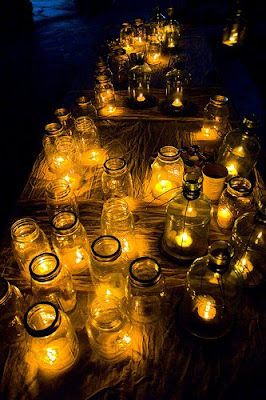 lovely mason jar candles. simple, cost friendly and unbelievably romantic. I guess I don't get this whole "romance" thing. I mean the romantic movement, it's historical identity, was about an violently emotional attitude towards nature, including horror and awe. I don't think you'd honestly want that in a relationship. So obviously the term is being mis-used. What exactly do people mean when they say romantic, in the context of love or relationships? It seems like some kind of unconscious psychological projection more than anything really concrete. I think you need a therapist, anonymous. I can't beleive I found your site. 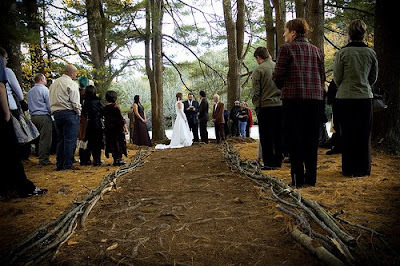 The picture I have in my mind of my wedding is just like yours was, from the forest wedding to the mason jars, to the laid back family gathering. Thank you so much for posting your pictures they are a great inspiration for me.